Now I am defo on the fence about trying the Pixi Tonic. Where can you find it?! I totally agree on Illamasqua blushes. Somehow I also always forget to use them. As for BB, I love it way more than RT sponge but I'm still considering the price...RT is truly a good dupe! I just got the Real Techniques sponge as a birthday present for myself (we deserve those too!) and I am in love with it. 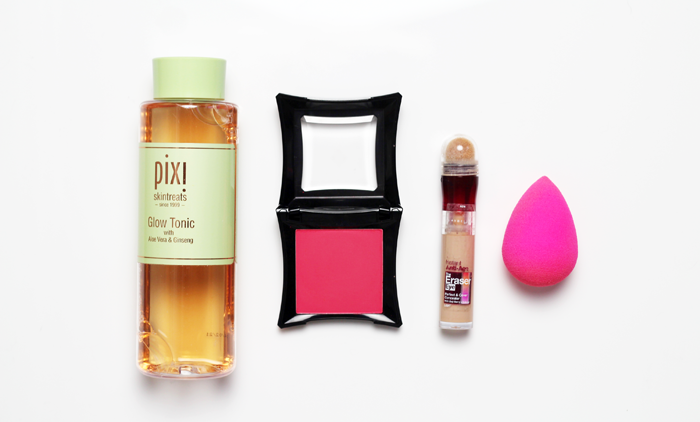 I haven't tried the Beauty Blender, but I love my sponge so much that I don't need to! I'm with you on the Beauty Blender! I love it but I wouldn't buy it again! I've heard so much about the Pixi tonic, but knowing your opinion on it stopped me from buying it early on. I'm sure I'll try it one day, but I'm not in a hurry. Is the Illamasqua blush packaging as bulky as its eye shadows? I own one of their eye shadow quads, but the packaging is ridiculously large, and I haven't bought another of the brand's products since. I like carrying the blush I'm using around and I can't imagine being able to if their container is big. I have Pixi Glow Tonic and whilst I'm quite happy with it I didn't notice anything wow with it! I must admit I think mine has gone off as the colour has changed some what so I think I need to update it and give it another go. Well must say it's refreshing to come across a post that highlights some of the items I've seen raved about is straight up honest about them by saying they're great but you wouldn't buy again. I've been debating on that beauty blender for forever! I've always wanted to try Glow Tonic + I love the Maybelline Concealer. I feel this way about Revlon mascaras.